Hurricanes and Cyclones are downright scary. I lived in Florida when Tropical Storm Fay came through, that was pretty minor with lots of flooding. I moved north to Philadelphia to escape the tropical storms (and for other reasons), and was in the area when Sandy 2012 and Irene 2011 roared through. While where I was at saw little damage, a few downed trees, power outages and such both those systems did tremendous damage. Despite being fairly low on the Category number. Also the damage wrought by Florence and Michael recently is quite amazing. 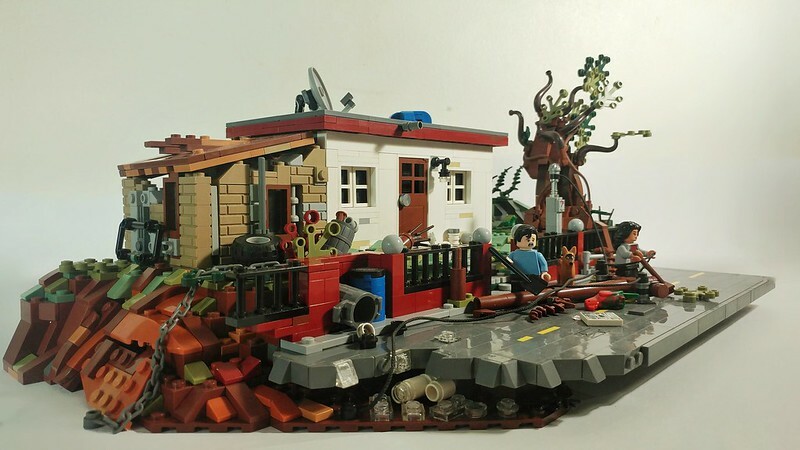 Nathan C MOCS really brings the damage home in brick for with this amazing educational MOC depicting what Hurricane Maria did last year to the Island of Puerto Rico. He experienced the storm first hand. In this build he has a number of moving elements that illustrates the forces hitting a house in Puerto Rico, the video of is here. I encourage you to spend some quiet time watching the video and examining all the notes that Nathan C MOCS has left on the image below in Flickr. This is a MOC that will challenge you, maybe scare you, definitely not one that gives happy feelings. The destruction is captured very well, it is a beautiful build in a devastating way.